Location. 36° 4.169′ N, 79° 24.025′ W. Marker is in Graham, North Carolina, in Alamance County. Marker is at the intersection of Main Street and Elm Street on Main Street. Touch for map. The marker is located to the right side of the north steps of the courthouse. Marker is at or near this postal address: Court Square, Graham NC 27253, United States of America. Touch for directions. in a direct line); The Harden House (about 500 feet away); Originally a Wing of the Union Hotel (about 500 feet away). Touch for a list and map of all markers in Graham. Regarding Alamance County Courthouse. Prior to 1849, court for the region was held at Providence Meeting House on North Main Street, Graham. 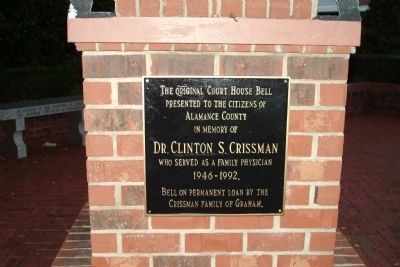 The new county of Alamance was formed in 1849, and Graham was named its county seat. 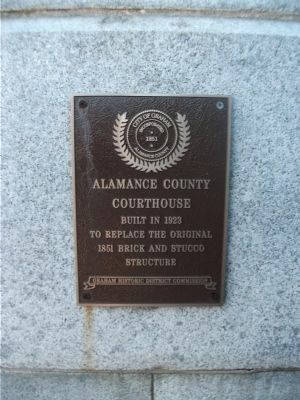 On July 17, 1849, the Alamance County Commissioners voted to spend $8,000 to purchase land and construct a courthouse in the approximate center of the new county, about two miles south of the Providence Church. The courthouse itself was constructed with brick and roofed with either tin, zinc, or copper, and was built with the help of slave labor for $6,400. 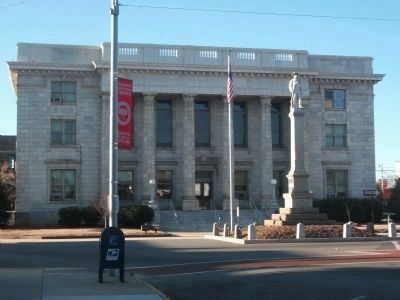 The original courthouse was remodeled in 1882, 1888 and again in 1889 at a cost of $7,500, adding 2 additional wings and stuccoing the outside of the building. 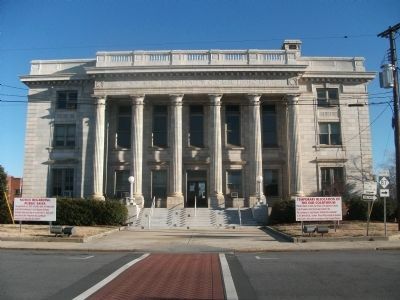 The current three-story courthouse is a Neo-Classical Revival style building. It was designed by Harry Barton (1876 - 1956) of Greensboro. Barton, a well-known architect of public buildings, including many courthouses across North Carolina. The current courthouse began construction on November 17, 1923 and opened to the public on November 23, 1924 at a cost of $253,925.82. It has received occasional facelifts since then. The roof received major work in 1996 at a cost of $1.2 million. 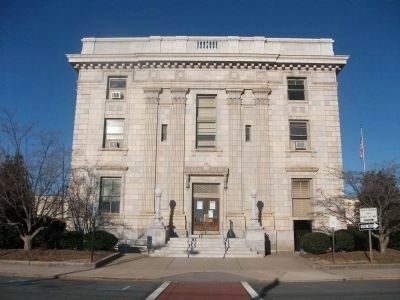 In 2010-11, the courthouse received a $3+ million major internal facelift with the intent of making the building safer, restoring some elements to their original 1924 state, removing asbestos, and repairing major internal damage done to the courthouse over the years. 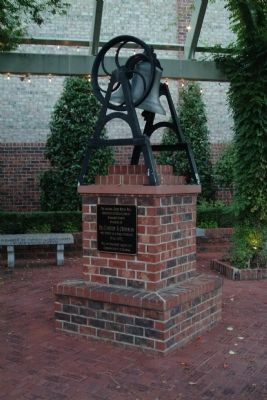 The bell is located in the sesquicentennial garden, across the street from the northwest corner of the courthouse. More. 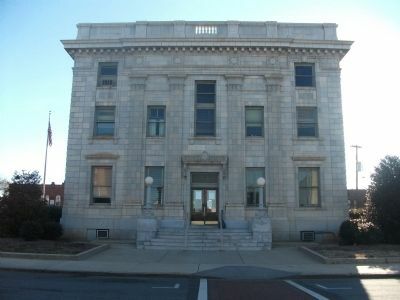 Search the internet for Alamance County Courthouse. Credits. This page was last revised on June 16, 2016. This page originally submitted on August 27, 2010, by Paul Jordan of Burlington, N. C., U. S. A.. This page has been viewed 1,261 times since then and 4 times this year. Last updated on January 26, 2011, by Scott Ward of Graham, North Carolina. Photos: 1, 2, 3, 4, 5, 6, 7. submitted on August 27, 2010, by Paul Jordan of Burlington, N. C., U. S. A.. • Kevin W. was the editor who published this page.